These mid-top moccasins were not exactly easy to make, but they were easier than I thought they would be. Why did I make them? Because I had ordered some canoe mocs online and while I was waiting, I got impatient. 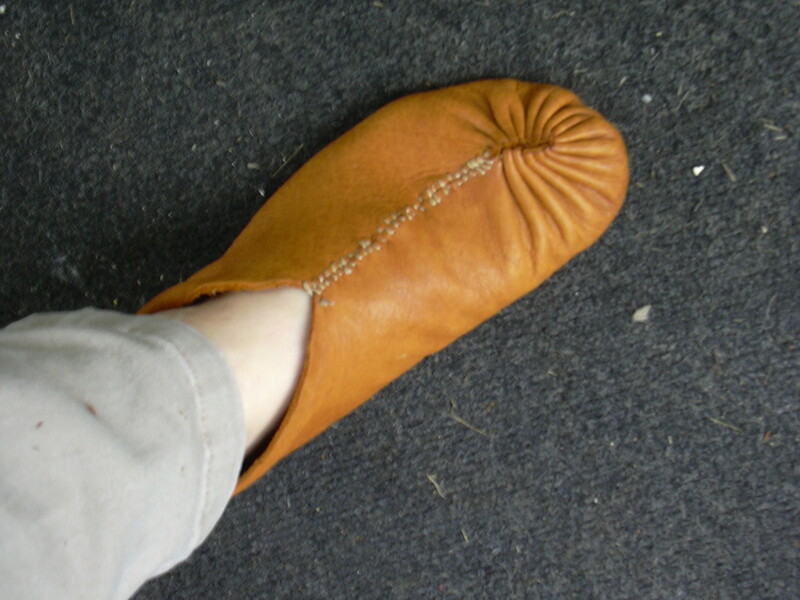 I'll try to make some rough moccasins now in anticipation of the wonderful shoes to come, I said to myself. After all, we're in an economic depression (at least, I think we are) and do-it-yourself has become not just a fad, but a survival skill. So I made moccasins for my child. 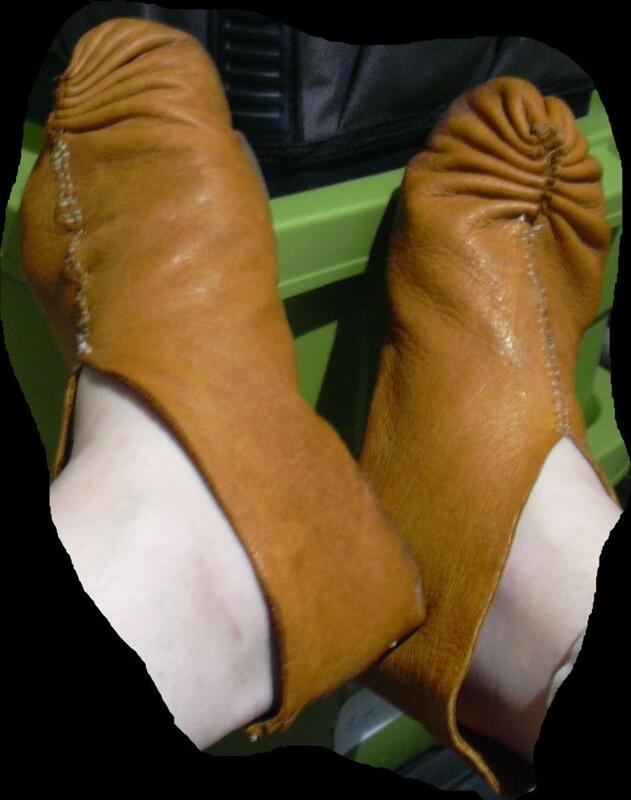 Not these - another pair, out of an old purse, after studying a pair of moccasins my husband owned. I just threw them together with some latigo lacing from my husband's toolbox, and while they were lacking in many ways - they turned out more like a slip-on slipper - I was amazed I could do it at all. So then I made another pair. This one was better - it had a heel that stayed up! Then I made a pair for myself - similar to the moccasins I'd made for the kid, out of black suede buffalo leather I got off of eBay. The leather was nice, and the moccasins weren't bad - but they were pretty loose. They flopped around and didn't feel much different from slippers. I liked them, but I was seduced by phrases like "fits like a glove" and "molds to your feet" that I had read on forums, and knew I wouldn't be satisfied with anything less. Besides, now I was hooked. I remembered that years ago, I had tried to get into leatherwork, but got discouraged by hand pain due to not having a decent cutting implement or awl (I used a scratch awl and regular household scissors - ouch). Now I have better tools - a pair of good shears and a whole box full of my husband's leatherworking stuff. There was nothing to stop me! 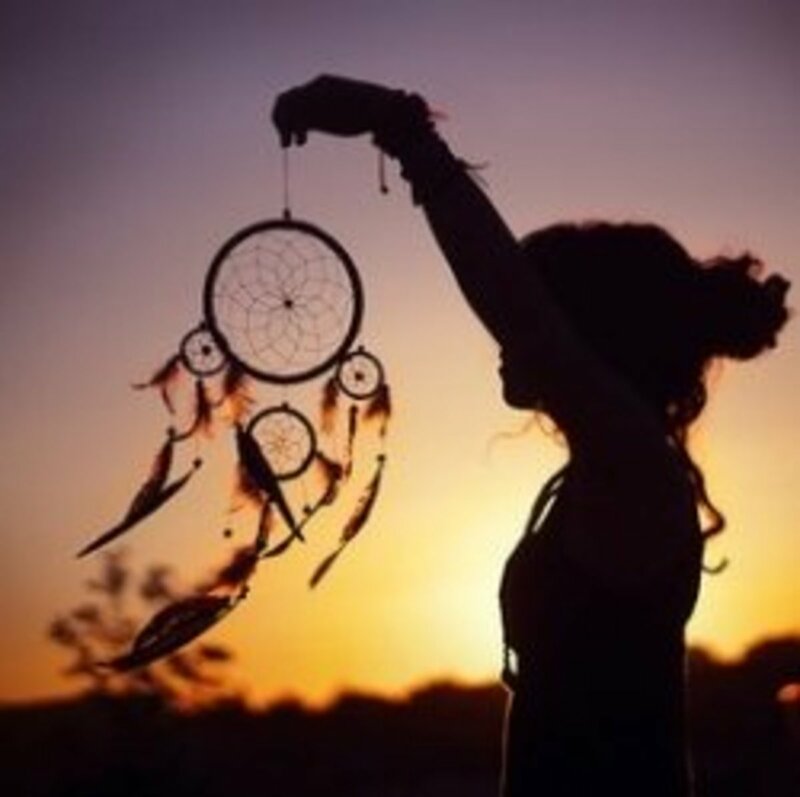 I walked in wet grass and let them dry on my feet to help the moccasins shape comfortably to my feet. 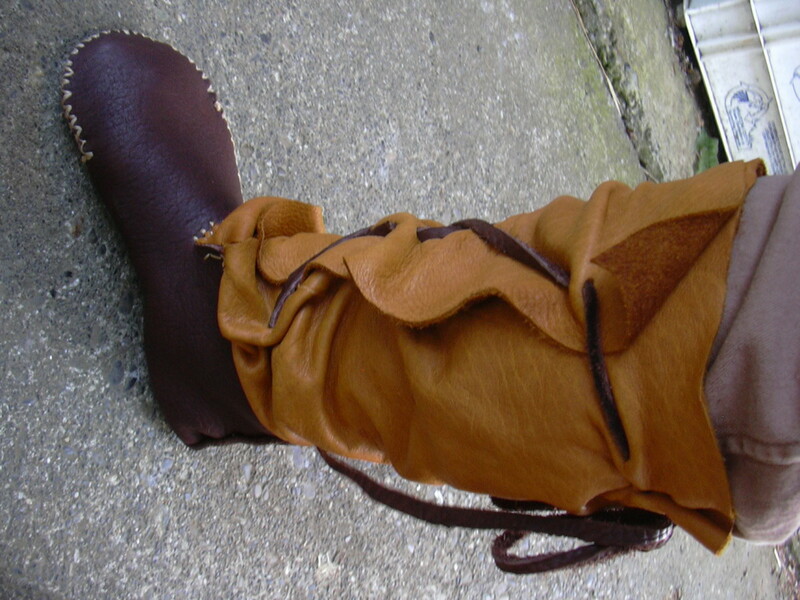 So I made this pair of side seam moccasin ankle boots, using a pattern I found online. I was flabbergasted at how comfortable they are. "Fits like a glove" took on a new meaning for me. 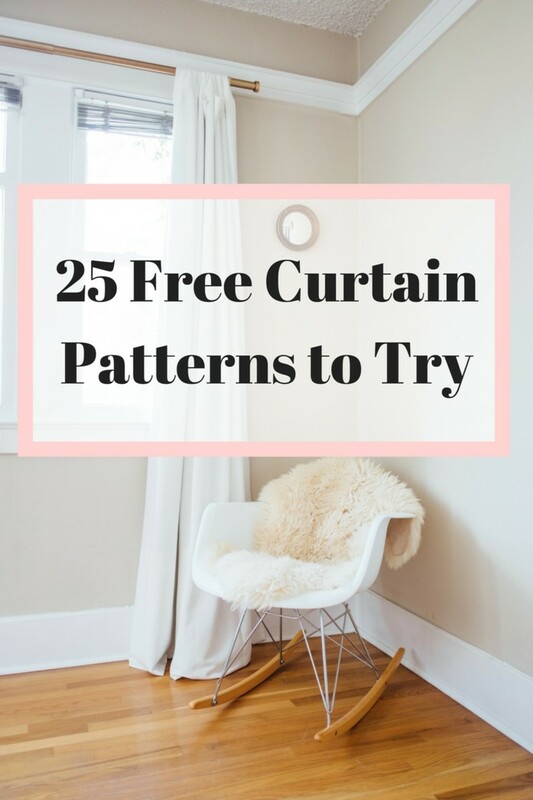 They were made from patterns I created by tracing the soles of my feet, which are two different sizes - a fact that means that all my life, at least one shoe hasn't fit well. In addition, I have a bunion on the larger foot that is often the deal breaker for new pairs of shoes. These moccasins don't hurt my feet at all. These are totally custom made out of better leather than I've ever had. 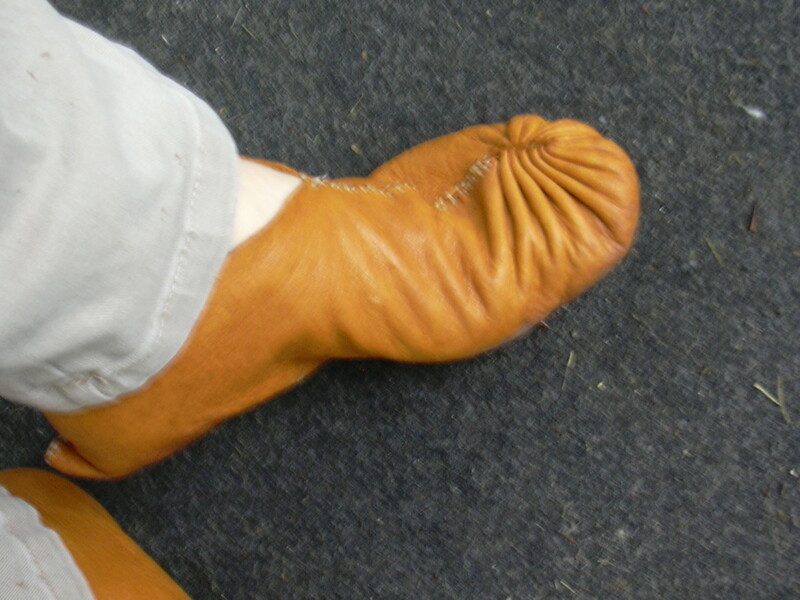 Tanned buffalo leather is middling stretchy - not as stretchy as elk, but more so than molded store-bought shoes - so soft and supple, and the moccasins have only gotten more comfortable the more I've worn them, even if I did size the larger foot too small initially. Within a few days, they stretched to fit me perfectly. The pair after a few weeks of wear. Notice how the shape conformed to my foot. Also notice how the heel tab slipped under the sole - something I need to work on! Poll: DIY Moccasins On the Rise? 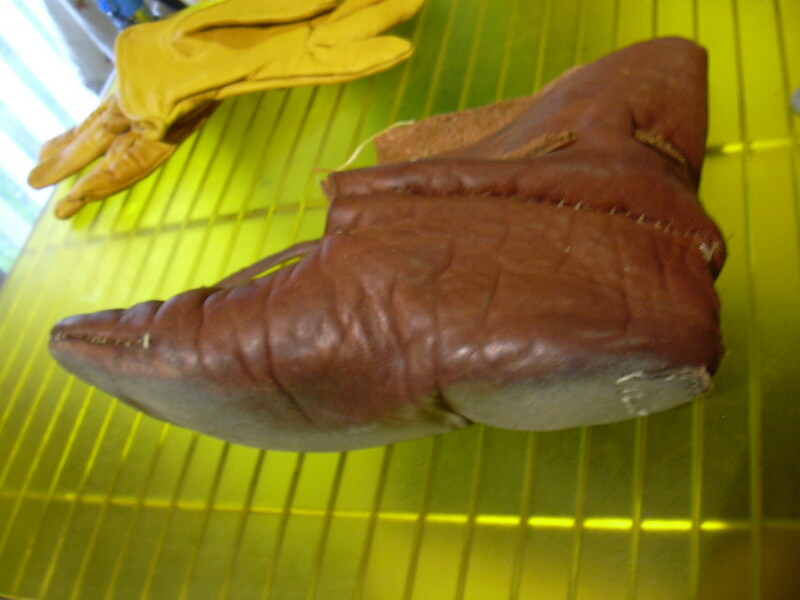 Do you aspire to make - or have you ever made - a pair of leather moccasins? I've never made a pair of leather moccasins before, but who knows - pigs could fly! Yeah, I've made a few pairs of moccasins in my life (modest foot scuffing). 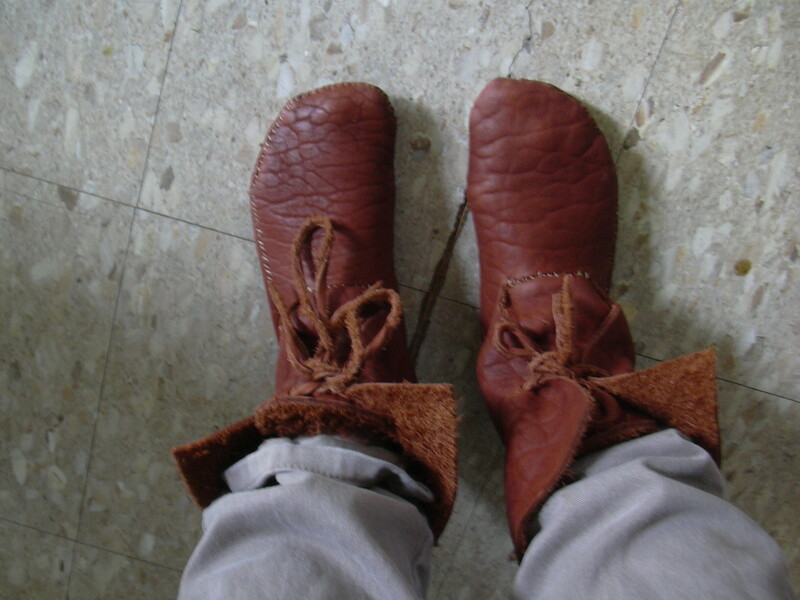 I've made moccasins out of leather before, long ago, and might do it again...maybe.. I've made a lot of moccasins in my life. Oy, the moccasins I've made! You call these scrapped-together-footies moccasins? I make a living out of making moccasins. I'll show you moccasins. I've been making moccasins since forever, and plan to make them until forever. I don't really want to make moccasins. I just have a thing about shoes. These were my third - or was it fourth - try at experimenting with new styles. My third try was a pair of center-seam moccasins that came out odd - the left one pinched the toes, while the right one was like a sack around my foot. 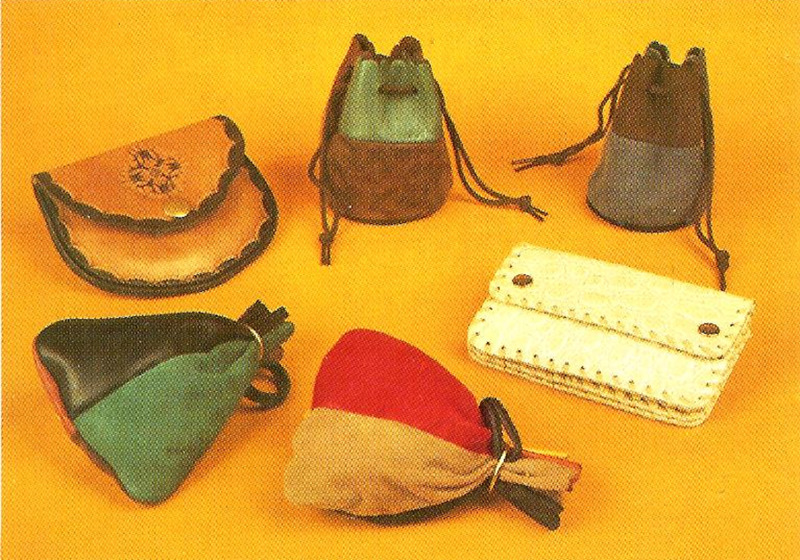 These are made of thin, medium-weight (4-5 oz) elk leather. They are soft and exquisite on the feet. I wear them both inside and outside. I haven't treated the leather in any way to make them water resistant (waterproofing is impossible), because I learned that water resistant leather actually takes longer to dry, and the climate I live in is positively dripping. To make these, I watched an instructional video twice describing how to make these pucker toe moccasins. It seemed so easy so I thought I'd try it. Using stretchy elk leather of 4-5 ounces (much easier to sew than the heavyweight buffalo hides I'd used before), and a sharp-pointed glover's needle instead of an awl, I made a simple version of these for myself and for my child without any uppers (see the photos). 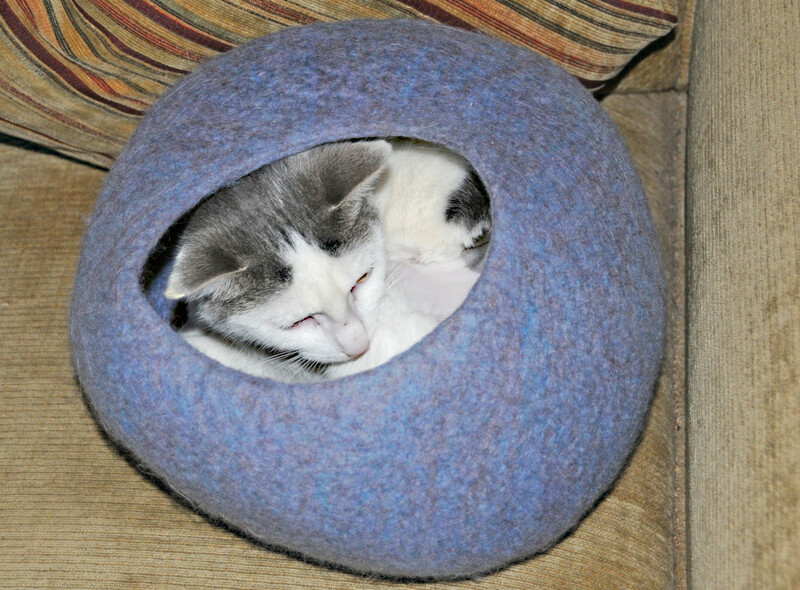 Making the puckers in the front was much easier than it looked - it used a simple running stitch - though they are admittedly askew. Did I mention they are unbelievably comfortable? I noticed a version of the moccasins was also in the fabulous (and surprisingly hard to find) book that I had ordered, Craft Manual of North American Indian Footwear. 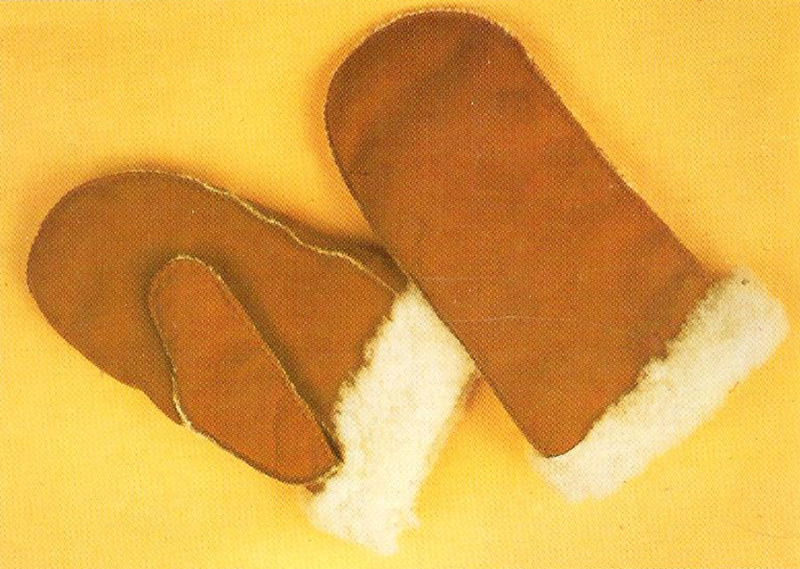 The book has patterns that you need to copy yourself for many different styles of moccasins. It also is written in a super-concise way, which means you have to figure out a lot of things yourself, or get the accompanying DVD, which I haven't done. And there are some spelling errors and such. But - what a resource. 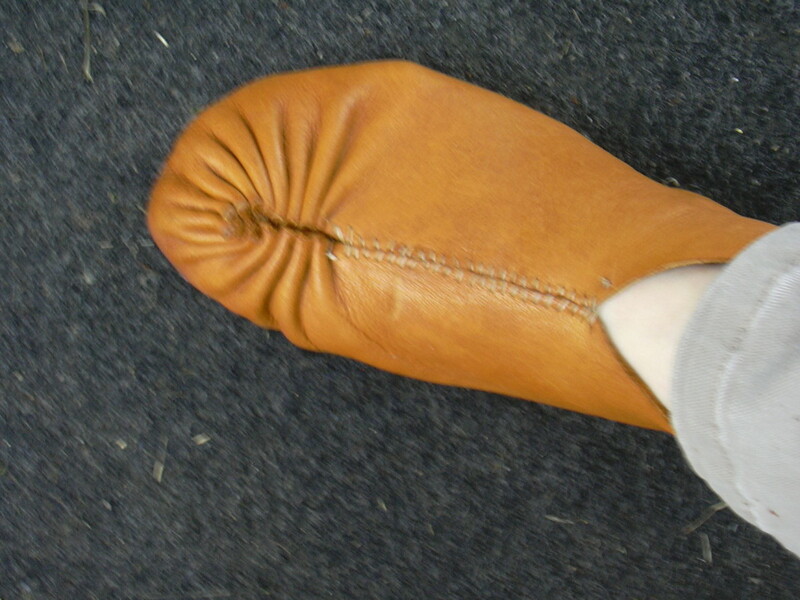 Anyway, the instructions on page 47 for the "Simple Pucker Slipper Type" describe a very similar moccasin, but with a pointed heel. 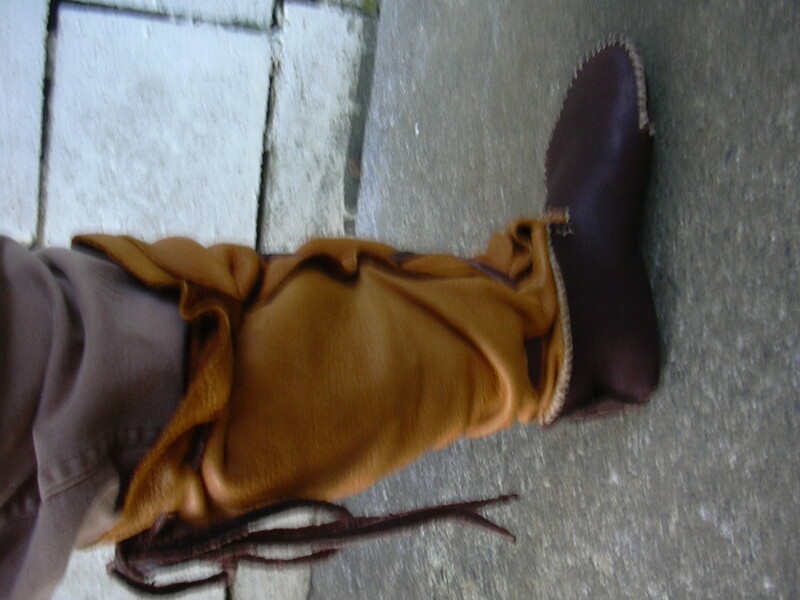 I wanted to try to make moccasin boots, so I just finished some brown and gold moccasins. The experiment turned out pretty well, though my ambitions again exceeded my skills. One improvement: I made a longer heel tab so it acts as a heel stiffener and maybe won't slip under and become the sole like the other side seam pair. I did make the right foot a bit wider, and that worked out great. 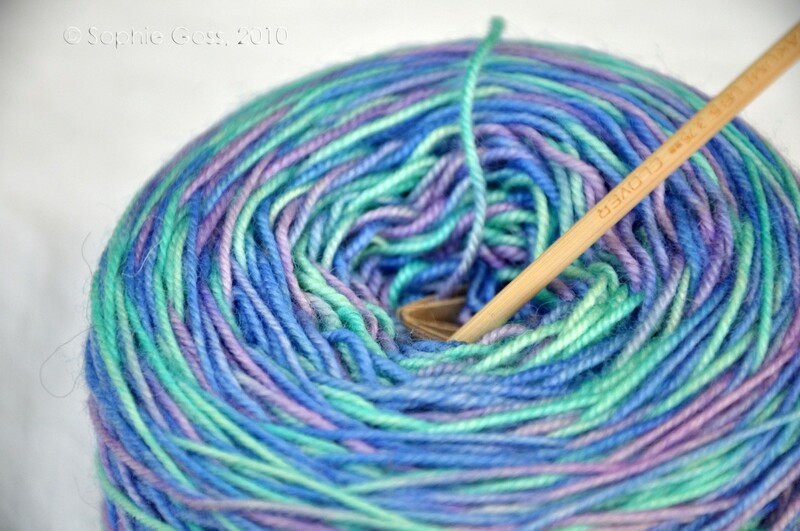 I also am in love with my jumbo sized Perma Lok needle, which makes lacing 1/4" 9 oz leather a breeze. My latest pair of high top moccasins, before breaking in. Buffalo brown on the vamp and sole and elk uppers, with buffalo lacing. This type of moccasin is usually sewn inside out, but I did them right side in because the leather is so heavy they're hard to turn. Definitely my mountain girl look! The lacing is pretty messy. I pretty much just rigged whatever would keep the darn things from falling down. This book is concise gold, worth every penny I paid for it. You do have to study the images and instructions thoroughly. A lot of the patterns circulating on the web seem to have originated from this book. It's kind of the moccasin-making folk bible. I have a lot to learn, and a lot of projects I want to try. I'm determined to figure out how to add a sole onto a moccasin. The one-piece moccasins I've been making so far (one piece referring to the fact that the sole is from the same piece of leather as the upper part of the moccasin) will wear out quickly. I want to be able to add an outsole to any moccasin style, because when you do that, you only need to replace the sole over and over again, rather than recreate the moccasin each time. How Are My Feet Doing in Moccasins? My guess is that only people who have plantar fasciitis will be interested in this section, so I'm tacking it on at the end. I've been walking in soft-soled moccasins for a few weeks now. I'm walking on hard ground and on grassy, uneven terrain both. There is no arch support and the shoes are flexible, which is counter to some of the stuff I talk about in my article on treating plantar fasciitis. If I had done this when my problem was acute - when I was still in pain - I am pretty sure I would have been hobbled. I needed arch support and stability to heal. But then gradually over the course of the year, it's gotten to the point that my feet have done so much better I've been wanting to build up to going barefoot. My frustration with shoes that don't fit my odd feet well has soared as I realize how much money I've spent on shoes. I learned that you actually can build up the arch muscles in your feet. So I've been wanting to try minimalist shoes. So far, I don't know if they're helping, but they are not hurting. No return of heel pain. Nada. So it's looking good. I'll try to update as I learn more. Update June 2015: Still wearing moccasins a lot, though not all the time. Still love them. Still not aggravating my plantar fasciitis. Keeping my fingers crossed! Find the link on this page for Beautiful Shoes - it's all about different styles of Native American moccasins. 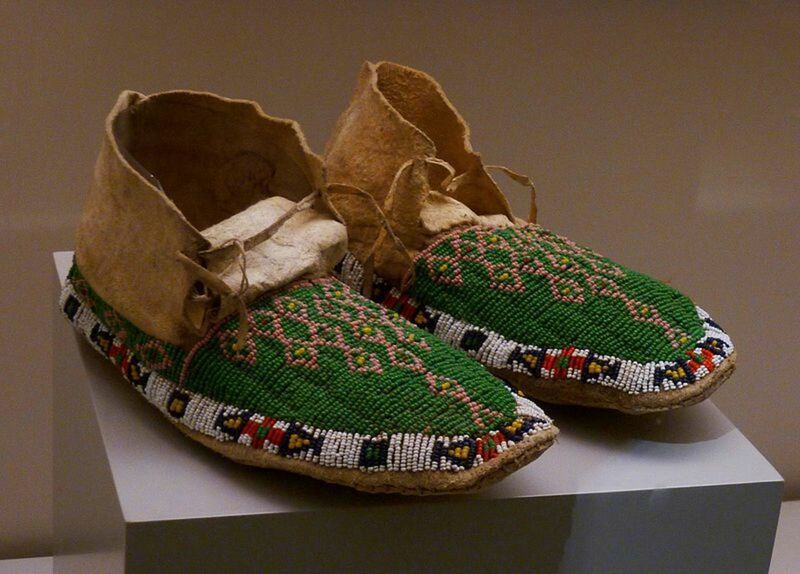 Look down the page to find a wonderful PDF document detailing many kinds of moccasins. 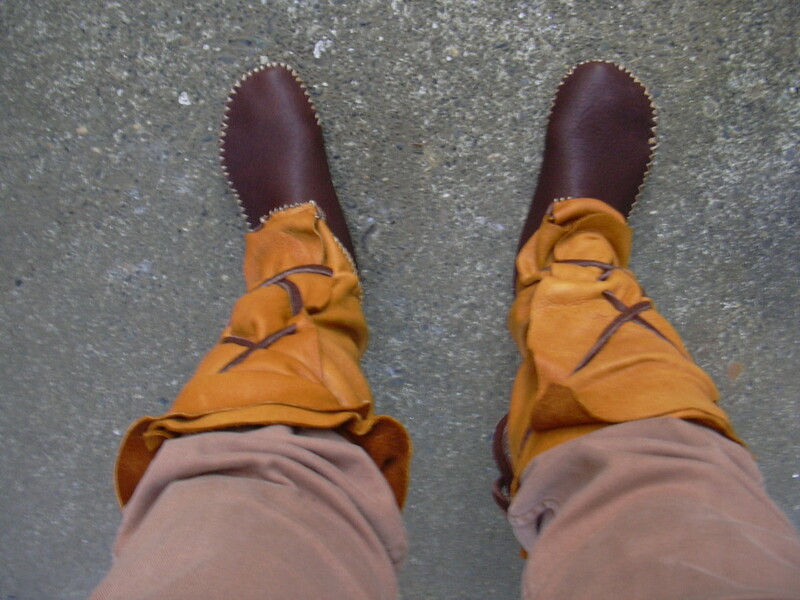 This is not exactly moccasins, but moccasins and medieval turnshoes share a lot in common. 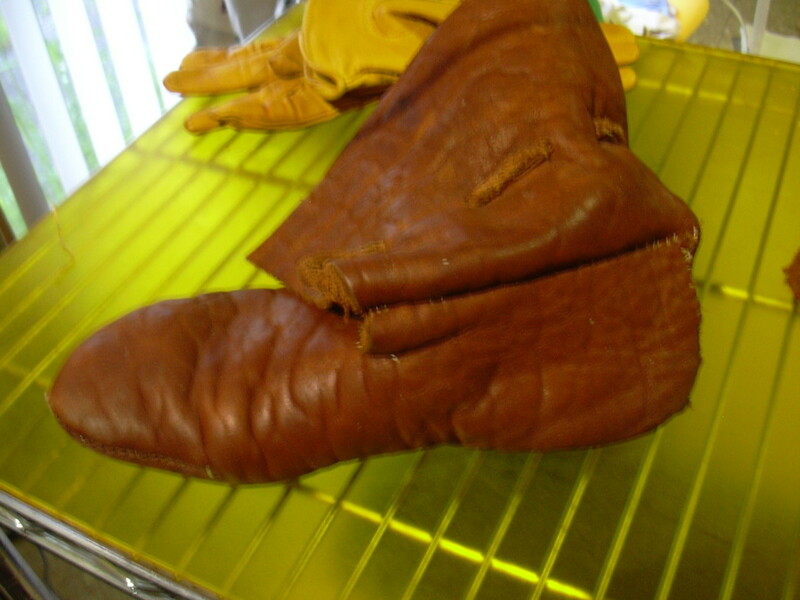 If you scroll down on this page, you'll find PDF documents on old medieval leatherworking, including shoe stuff. These are the shears I used to cut through thick, tough leather. I'd previously bought another larger version of the same model, but my husband watched me cut a strip of leather with them as if the leather were butter, said, "Let me see them a minute," and when I handed them to him, he calmly put them in his toolbox. I sighed and then got myself another pair, this time a bit smaller to suit my medium sized hand. The author of this article would like to disclose that she is a writer by profession and has all the mercenary instincts for which such creatures are famous. Thus, she may earn commissions on Amazon.com and eBay purchases made through links on this page. Forgive her, readers, for while she has not sinned - in fact, she makes it a point not to promote any product falsely - she does confess to earning a living, and federal guidelines encourage her to share this fact with her readers (who may of course read this article for free, regardless). Anyway, I hope you make some moccasins. Please tell me how it goes and what you think. As I learn more and make more, I hope to post more pictures on this page or in a separate article, if the length of this one gets too unwieldy. Really sweet how-to hub! I like the way you write, and I like your DIY attitude.